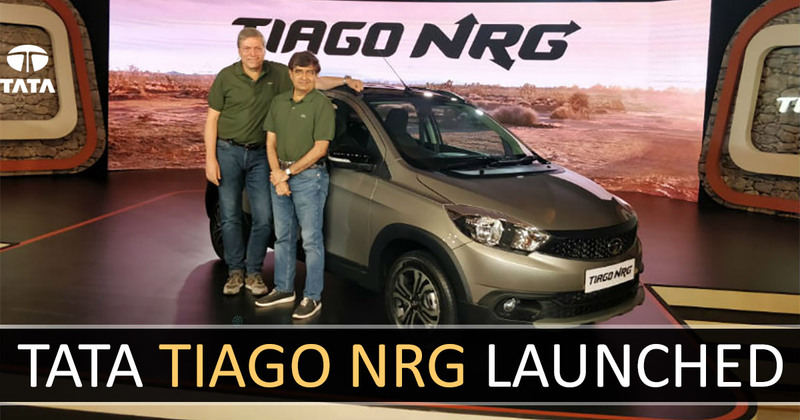 Finally, Tata launched the much anticipated Tiago NRG at an introductory price of INR 5.5 lakhs petrol version and for the diesel version, the asking price is INR 6.32 lakhs ex-showroom Delhi. The price of new Tata Tiago NRG is around INR 30,000 expensive than the top spec Tata Tiago XZ. The newly launched Tata Tiago NRG features a whole body kit in a black contrasting shade. The added kit makes the Tata Tiago NRG a bit like SUV as per design language. The kit includes rear and front bumper add ones done with faux brushed aluminium scuff plates. It also includes a trim design on the wheel arches and running boards. The basic difference both the Tata Tiago basic and NRG version is the increased ride height as it encompasses 180mm of ground clearance. As per the appearance of the new Tata Tiago NRG, it has a black front-grille, roof with black colour, black roof-rails, black wing mirrors and door handles. The Tata NRG has a projector lens headlamps with the latest design for the new 14-inch alloy wheels. Coming to the interiors, the new NRG model gets a contrasting orange colour theme for the dashboard. It has also the electrically adjustable wing-mirrors and a cooled glove box. For the safety purpose, it is the only Tata Tiago variant with the 5.0-inch touchscreen infotainment system turning into the reverse-camera display. For the sound, it has the four-speaker Harman sound system. The new Tata NRG has the same Engine including an 85hp, 1.2-litre petrol engine and a 70hp, 1.0-litre three-cylinder diesel unit mated to a manual five-speed transmission.